Past & present, March is a great month for Classic Car enthusiasts. We, here at Gallen Insurance, are proud to not only offer you the best in classic car insurance, but the best news, advice, trivia and events in the Reading, PA and central Pennsylvania area. March 15, 2014:: Time to take the classic cars out of the garage and and the classic clothes out of the closet for the Pottstown Classics Car Club Annual Spring Dance at the Keystone Fire Company. Dance the night away to your favorite oldies and classic rock, enjoy free beer and soda, a family style dinner and auction. Tickets are $25/ea or 2 for $25. 7pm. March 2, 1966:: Ford Motor Company celebrates the production of its 1 millionth Mustang, a white convertible. The car had only debuted 2 years earlier in April of 1964. March 8, 1950:: An infamous day in hippy car history. 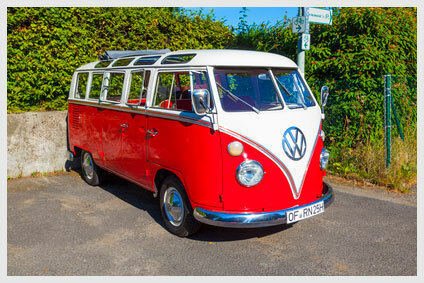 The VW Bus goes into production. March 13, 1969:: “The Love Bug,” a Walt Disney movie about the adventures of a Volkswagen Beetle named Herbie, opens in theaters across the United States. March 14, 1922:: Mack Truck founder killed in car crash. John “Jack” Mack, who co-founded what would become one of North America’s largest makers of heavy-duty trucks, is killed when his car collides with a trolley in Pennsylvania. Mar 18, 1933:: Studebaker goes bankrupt. American automaker Studebaker, then heavily in debt, goes into receivership. The company’s president, Albert Erskine, resigned and later that year committed suicide. Studebaker eventually rebounded from its financial troubles, only to close its doors for the final time in 1966.